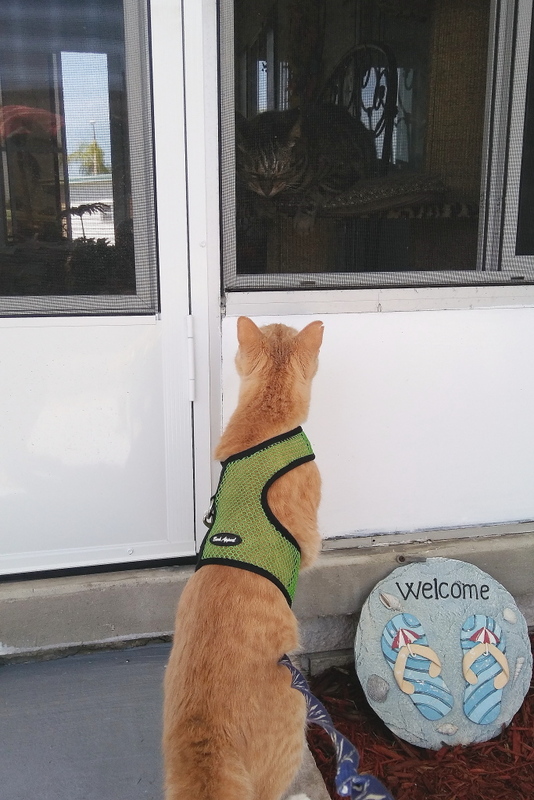 When I took Frankie for a walk on Saturday (after he smelled my tires thoroughly) he walked right past the neighbor cats who were watching him from the window. Frankie pretended not to notice and walked on by. On the way back I had to carry him because he rarely comes back on his own. As we passed the neighbor’s house, I could see one of the cats looking out the window near the door. The other cat was further away looking out a different window. I put Frankie down on the sidewalk in front of their house just to see what he would do. As expected, he walked right up to the nearest kitty to say hello. I thought Frankie was a gentlecat but the female cat inside was not buying his pickup line and he was greeted with a lot of hissing. Fearing the neighbor lady would hear that and think (or know) I was contributing to this invasion of privacy, I quickly picked up Frankie and brought him home. That was close. This entry was posted in Uncategorized and tagged Cats, female, funny, greet, hiss, male on April 4, 2017 by Charles Huss. She’s just playing hard to get. So that’s what Frankie does on his great adventures! I’m sure she’s waiting for the next encounter. Frankie thinks the whole outdoors belongs to him. Apparently the neighbor cat disagrees! I think the neighbor can might like Frankie if she gives him a chance. Poor Frankie, there are lots of other fish in the sea. Sorry she was mean to you. Maybe her sister would say yes. Yeah, we would have reacted the same way if a cat came to our door. We’re not very neighborly. It’s always different when you’re the cat on the outside.